A few weeks ago, I had the opportunity to attend Acton University, a wonderful yearly conference by the Acton Institute, through a generous fellowship from the Kern Family Foundation. Among other things, the Kern Foundation wants evangelical theologians to develop a richer and truer theology of work and a greater appreciation for the value of the type of work that most of our brothers and sisters in Christ do outside of churches. As a spiritual director and an “Aspirant to Holy Orders” (as Anglicans call those pursuing ordination), this has helped provoke me to think more about the spirituality of the vast majority of people I serve and sit beside in church. As a professor writing a dissertation on Bonaventure’s spiritual theology, I naturally looked to this 13th Century theologian for help. Bonaventure described a fountain of light pouring out from God the Father, so that rivers of grace spread out over the world. However, grace is not just for us to receive, it also flows through us. And grace is not generic. It works through different callings in different ways. Most people in the world are involved, in one way or another, in what Bonaventure would classify as “the mechanical arts.” That is, we apply knowledge and skill to the physical world in a way that creates and transforms it into something better than when we started. While Bonaventure probably wasn’t thinking beyond those who literally design and build physical objects, this category could also include entrepreneurs and financiers, marketers and salespeople, in that they too are responsible for the effects of these objects on the world. 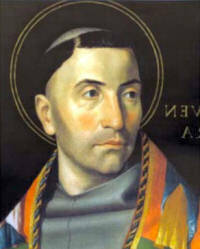 According to Bonaventure, those in the mechanical arts are fundamentally involved in ministering the mercy of God. Think of the architect who designs a house that literally protects a family from the stigma of homelessness and the suffering of being “in the elements;” a building that makes it less difficult for that family to feel a sense of connection and security. Now think of the construction workers, bankers, and realtors who also were necessary for that family to have a home. With all of the damage done by mortgage crisis, we should be more, not less, grateful for the instances we can find of God's grace working through people of excellence and integrity in the housing industry. With the larger financial crisis, think of the financial advisors who succeeded in protecting the retirements and college funds of their clients through their skill and effort. Again, it is God’s mercy, whether these workers are aware of God’s common grace or not, that is working through them. There are three applications to this. First, all of us need to give more attention to the spiritual calling of all of our brothers and sisters in Christ. It isn’t just coffee-break evangelism and a “good witness” that Christians working outside “professional ministry” are called to. We need to recognize God’s ministry in every kind of work that blesses and serves others. Second, each person should give serious thought to how God works through his or her profession. If it is by giving mercy through the product of your labor, then a critical spiritual discipline is to mentally frame your daily work as worship to God by ministering mercy. How specifically are people, customers as well as coworkers, receiving mercy through what you are doing today? Third, and this is Bonaventure’s most profound and mysterious point on the topic, we should meditate on the characteristics of God that He ministers through us as a way of being drawn into deeper communion with Him. Go beyond framing your work in terms of God’s mercy. Meditate on the God who is merciful throughout your day. Wonder at a God so loving that He wants broken, hurting and hurtful, sinners to live in the beautiful homes you build or to have peaceful and delicious lunches with friends at your restaurant. He cares about the cars you sell or the accounts you balance. Contemplate Him in awe, today and every day. Finally, let me confess that as a spiritual director, I have helped directees carry prayer into their work days, but I don’t know if I have ever thought to help them pray through their work or discover the grace already active in their professions. I’m only beginning to think about how a Christian’s specific profession should shape her spirituality, or how a particular Christian’s daily prayer should look different because of what he does during his work week. I suspect this is a too common failing among spiritual directors, pastors, and seminary professors. We in “professional ministry” need to give serious reflection to the ministries of common grace of our brothers and sisters. As a student at Southwestern Baptist Seminary I work on campus as a security officer here in Fort Worth, TX. Unfortunately I have been looking at my job here as just something I have to do to put me through school so that “real” ministry can begin after I graduate. To think of it as a ministry of mercy of protection for the students that live at the campus has not been at the forefront of my mind as I go about my work day. This had led to laziness at times and Instead of working as though I am working for God and not for man. Thank for this post. Thanks for the response Jim. That’s exactly the sort of application I’m thinking about. For the final application in my post (the part about meditating on God as His character relates to your work) it might be helpful to think about the protection of God as you work. Maybe memorizing one of the many psalms having to do with protection (or even a verse or refrain from one) and reciting it from time to time as you work will be helpful. I read Psalm 5 this morning, which ends with “For you, O Lord, will bless the righteous; you will defend them with your favor as with a shield.” Both thinking of your work as defending the righteous and praying to God as the One who gives His favor as a shield could be a powerful way of worshiping God both with and through your labor. Thank you for the thoughtful post. I have been only recently thinking and struggling through the meaning of my own work which is actually in real estate investing. Your post is an encouragement for me to keep my eyes open to see how God’s grace is moving through the various people I interact with through the day. Thanks. Thanks for this! Lately I’ve been talking and thinking through what the Christian life should look like in the day-to-day world, and this hits exactly some of what I was arriving at, along with adding a few new insights. And it’s always comforting to find that wise people before me have shared some of my thoughts. I have the joy of working outdoors in public gardens all week long, and I try to keep myself conscious of the beauty of our creator while doing this. However I hadn’t thought of my work as glorifying the beauty of creation and creator for others to marvel at – I was missing that crucial step of directing my thoughts to others. Thank you again! I will work even more diligently with this in mind. This is a danger inherent in professional ministry: ministers and other Christian leaders can come to look down on laypeople. Here we are reminded, however, that God honors those who realize that their ministry does not commend them before God or make them superior; rather, we are all the objects of his grace and mercy. Ryan, thank you! You’ve addressed an area that has been weighing heavily on my mind, as well as my husband’s. He’s an iOS developer, creating all sorts of apps. We’ve been trying to flesh this out in light of God’s kingdom. What would that look like in the thoughtful framework that you’ve laid here?